Watching: The Making of Riley Paige: Book 1 is a psychological thriller written by Blake Pierce. Riley’s Thursday night plans revolved around hitting the books for her early morning psych class, but her roommate, Trudy, and their friend, Rhea, had different ideas. They were college seniors after all, and there was plenty of music, alcohol and eligible males waiting for them at The Centaur’s Den. Riley eventually realized that they were not going to give up on getting her to come along. When they entered the bar, Riley regretted being such an easy mark. It was noisy, crowded and filled with smoke. She turned down the other girls’ offer to dance with them and went downstairs where there were booths and tables -- and a bit of peace and quiet. Some time later, when she saw Trudy coming downstairs with a few other friends, she wondered where Rhea was. The other girls said that she had gone back to the dorm, something that Riley thought was the right thing for her to do as well. The glass of red wine she had indulged in had her feeling relaxed and easy, and she had met an interesting guy, so it hadn’t been a total washout. After she got back to the dorm, she quickly drifted off to sleep, but her rest was abruptly shattered by a piercing scream. Rhea’s body had been found lying on her bed -- her throat had been cut. 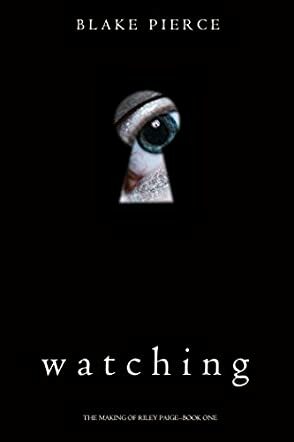 Blake Pierce’s psychological thriller novel, Watching: The Making of Riley Paige: Book 1 is a fast-paced and compelling story about a serial killer and the young psychology student who is driven to find the killer. I’ve always been fascinated by forensic profilers and their ability to get inside the mind of a killer, to see their motivations and become privy to their thoughts and emotions. Pierce’s Riley Paige goes from being a psychology major, with no real idea what she will do with her degree and her future, to finding herself working on Rhea’s murder in a hands-on, intuitive and, to her, often terrifying way. Pierce’s plot is solid and offers the armchair sleuth plenty of red herrings to mull over, and the characters are finely drawn and credible. I had a grand time witnessing the dawning of an instinctive forensic profiler’s skills and am looking forward to reading more books starring Riley Paige. Watching: The Making of Riley Paige: Book 1 is most highly recommended.